Super cheap but is it fit-for-purpose? Students showing off the new Tablet - Aakash. Image from Voice of America. If you recall, a week a or two ago, India introduced a super cheap computer, the Aakash for Rs.2250 (US$45/RM135). Well, a tablet computer to be exact. Over the years India has been well known for its initiatives in producing cheap and affordable stuffs. Not too long ago India's Tata stunned the automobile world with its US$2,000 car, Nano. It is understood that the tablet can be had at $35 with subsidy from the government, specifically for students. A commercial version would cost around $70 to be made available later. It seem that India is not the only nation building cheap computers. Bangladesh this week introduced the Doel, Android-based laptop in Dhaka priced at 10,000 Taka (US$130/RM390), according to BBC. Compared to Aakash, the price of Doel is a bit steep but for a $130, who can complain much about a fully functional laptop. I wouldn't. It is a very decent effort by creative individuals. For some, the ability to connect with the rest of the world and the convenience of being able to do away with papers is far more important than the built quality of the tool itself. Think about people with low household income of $300 to $400 but with decent educational infrastructure available around them. 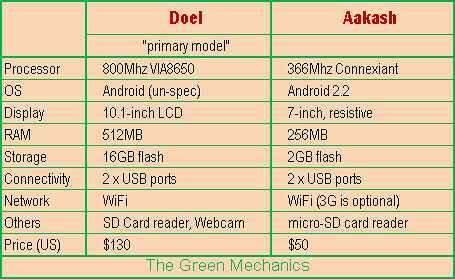 The Aakash or Doel may just be what they need, not iPad2 or the latest HP dv6 series. In two words - pleasantly cheap. Period. My only hope is that people don't sacrifice green with cheap. Please consider your e-wastes and the environment as you design your stuff, hopefully the smaller (and cheaper) the gadget the smaller the production waste will be. The Doel is essentially a scaled-down laptop like Aspire One, Lenovo IdeaPad, Inspiron Mini but priced much lower. Come on Malaysian IT enthusiasts, bring on your homegrown RM399.00 laptop/tab now. Afterall, who invented the thumb drive? Phua Khein Seng. He's a Malaysian. Call it Nuri, Bangau, Kenyalang, or even your name. Ya.. I've read about the Nano car and tablet and lower house income could afford for that. India is a good inventor and for sure its only fit to the need of the country and to the low income holder... we did not know what would be happen in a future. I believe its might 'useful' for short period but who knows..they could invents more cheaper, affordable and good quality same like in US. Time will tell..
Gila murah juga tu. And the Nano car?! Lawa la. Suda la traffic sana gila, tambah lagi kereta murah. Hehee jk. Alv808 - technology will improve at accelerated pace, so yeah, there would be cheaper, better cars & gadgets. Armstrong - bah mana sdh tu kreta Protong Galaxy yg harga RM10,000? Coming soon ka? "Call it Nuri, Bangau, Kenyalang, or even your name"